At Goodwill you have to turn over every rock. You never know what you will find! Not Leonard Pennario records, as a rule. Howard says that is because they are heirlooms. But there is always that chance, of course, that you will find some kind of treasure. And a lot depends on your willingness to look. The other day, making a quick stop at the Delaware Avenue Goodwill, I was checking out cookbooks. They have a nice book department at that Goodwill and books are sorted out by subject. Most of the cookbooks to be honest are not anything you want. There are a lot of 1970s and '80s cookbooks, microwave cookbooks, old fattening casserole cookbooks, and Crock Pot cookbooks full of recipes employing nothing but cans of stuff and whole cartons of sour cream. There was a pile of cookbooks on the bottom shelf. All cruddy looking, and one whose spine you could not see. I actually went through the trouble to lift all the lackluster cookbooks off the hidden book so I could see what the hidden book was. And I could not believe it. It was "Twelve Months of Monastery Salads"! It is by this Benedictine monk. 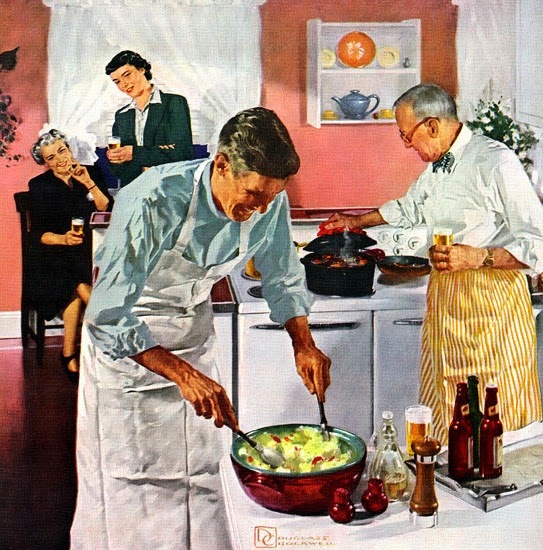 Men can make salads too as evidenced in the picture up above! I love this monk's other cookbooks. Remember the impossible Epiphany Bread? My sister has recommended this salad book and I had always had it in the back of my mind I would shell out for it. Well, now I have shelled out for it. And now I am off to make Sicilian Potato Salad. Another cook already put this on her Web log and so I will cut and paste. 1. In a deep salad bowl, put cook potatoes and add celery, onions, olive, capers, pickle, and parsley. Toss lightly to combine. 2. Whisk vinaigrette ingredients together in a small bowl and pour over the salad. Toss lightly, making sure evenly distributed and serve. Next time look for Twelve Months of Soups by the same monk. Cathy, I just now saw your message... thanks!! I do have "Twelve Months of Monastery Soups." It is a classic! I have a list of favorites from that book. We will have to discuss that!